Close to the action, Hilton Los Angeles North/Glendale & Executive Meeting Ctr offers easy access to Burbank, Hollywood, Pasadena and Los Angeles. Situated in Glendale’s business district, the hotel is minutes from famous attractions including Universal Studios Hollywood. The Hilton Glendale Executive Meeting Center's flexible function space and convenient location make it the ideal venue for a business meeting or event. Providing quality service and seamless events is a number one priority at this Hilton hotel. Host a meeting or reception for up to 850 Guests and enjoy the services of an experienced staff dedicated to making the impossible, possible. 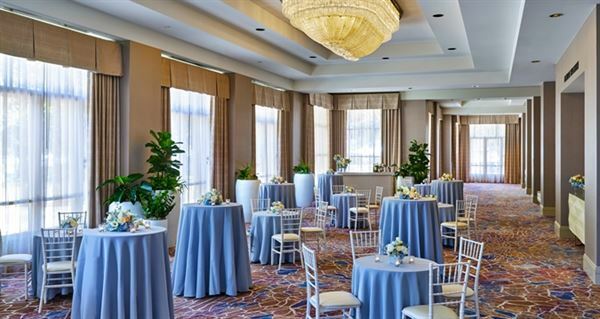 Our inviting Glendale Ballroom provides 8,052 sq. ft. of space for up to 850 reception-style or 720 in a refined seated banquet with plenty of room left for the dance floor. For smaller events, the 2,800 sq. ft. Brand Ballroom provides a more intimate space and gorgeous views of Los Angeles on a seated terrace. Special Features: High Speed Internet, Telephone-with Speaker phone, Photo Copying Service, Modem, Voice Mail, Fax & Printer. Business Services Include: Audio/Visual Equipment Rental, Business Center, Express Mail, Fax; USD 3.0, Meeting Rooms, Modem, Photo Copying Service, Printer, Secretarial Service, Typewriter, and Video Conferencing. The Hilton in Glendale has convenient and beautiful meeting space. They have an Executive Meeting Center (EMC), which is IACC certified. The meeting center is on the lower level of the hotel, and can be accessed through a nice stairway from the main lobby, as well as from the guest elevators. There is a concierge who is designated to work only at the Executive Meeting Center, and she helps with anything needed, including internet access at the computer stations and faxing documents. The hotel audio/visual department offers its services and sets up each meeting with what is requested. An event manager organizes the event from start to finish. This might include lunch or snack breaks, since nearby the concierge desk there is a snack area that is accessible only to Executive Meeting Center visitors. Since this venue is at a hotel property, there is a full kitchen, which offers catering options as well. One of the most convenient options that this venue offers is that the meetings rooms are a flexible space. There are multiple rooms at the Executive Meeting Center, and they can be arranged by the style of setup desired and the amount of attendees. There is easy access to outlets and internet connection for laptops, and there are screens for presentations. The space was built to accommodate the modern meeting. There are few meeting facilities that offer everything that the Hilton Los Angeles North/ Glendale offers. The experience comes with a price tag that might be on the higher side for some companies, but it is well worth the level of amenities and service.